With the default compression setting “Optimal compression” you need 4 CPU’s or 4 vCPU’s. If you want to use the “Best compression” settings, You need 8 CPU’s or 8vCPU’s. 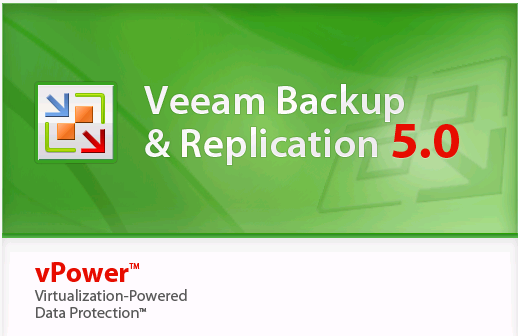 See page 14 of the Veeam Backup & Replication User Guide. 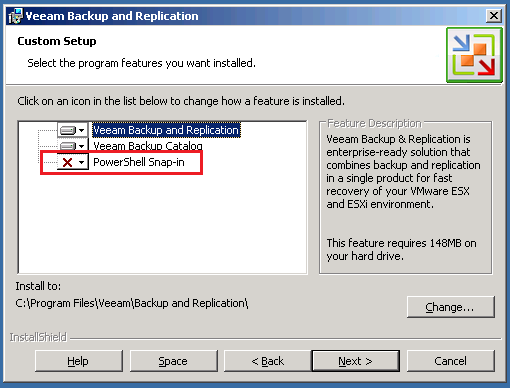 The next thing I wanted to mention is het PowerShell Snap-in. This option is disabled by default. Me as a Powershell “lover”, I don’t have a bumper sticker yet want to install this option. 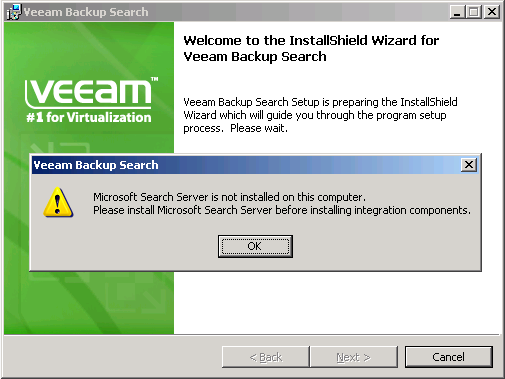 Going to play with it later so you can expect a post about the PowerShell Snap-in. 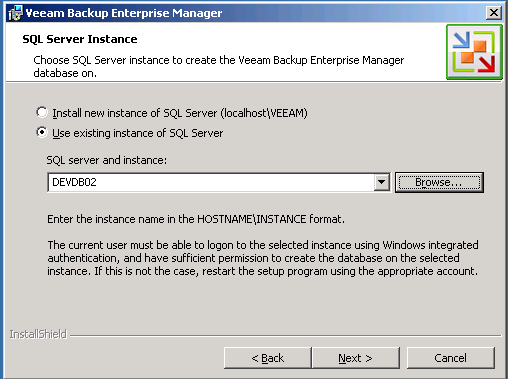 The current user must be able to logon to the selected instance using Windows integrated authentication, and have sufficient permission to create the database on the selected instance. If this is not the case, restart the setup program using the appropriate account. When everything is set you’re ready to continue the installation. 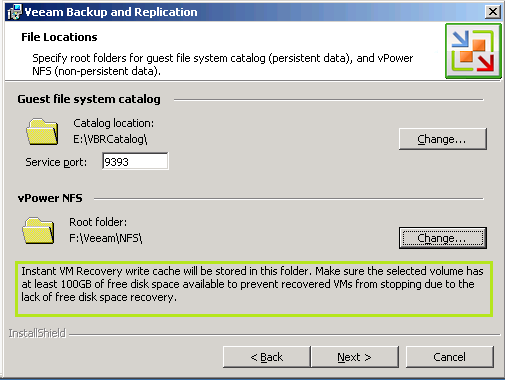 Service Settings: Enter a user with the appropriate permissions on the Server (NTFS) and the Database. 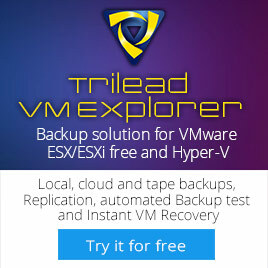 I wanted to use a service account but it’s not possible during setup. 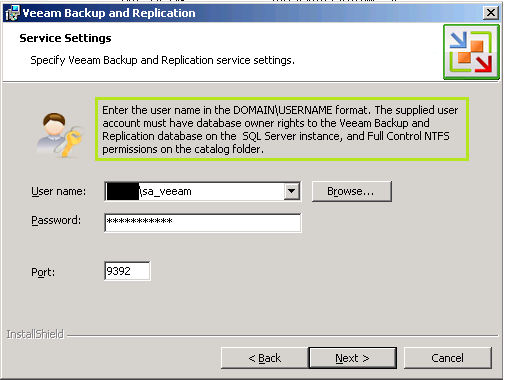 If you want use a service account you must create the VBRCatalog dir and set the right permissions on the database. 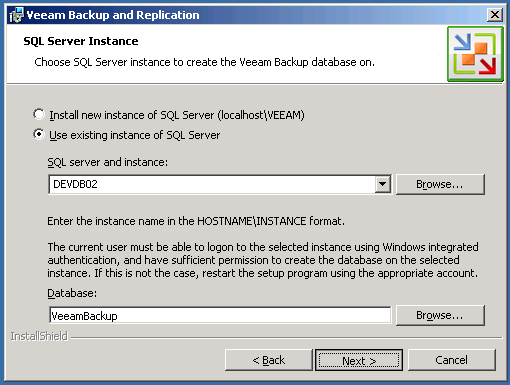 The last step is impossible because the database will be generated and populated during the setup. So I used the Administrator account during the setup. I changed the account right after the setup. 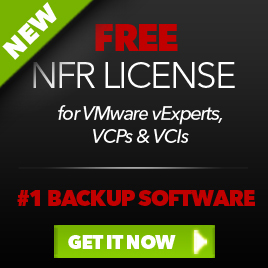 Set the Guest file system catalog and the vPower NFS folder. I used two separated partitions for these folders. The rest of the settings are default and next… next… finish will do the job. 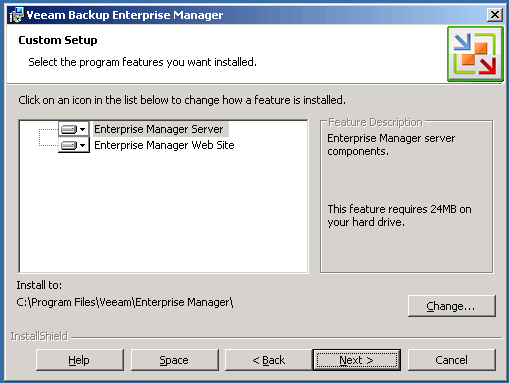 Service Veeam Backup doesn’t start. 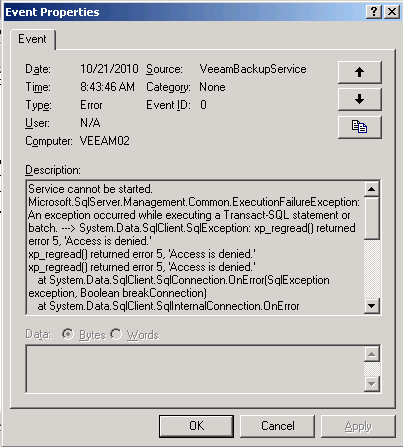 This error will popup when you use an account without the right permissions on the SQL database. 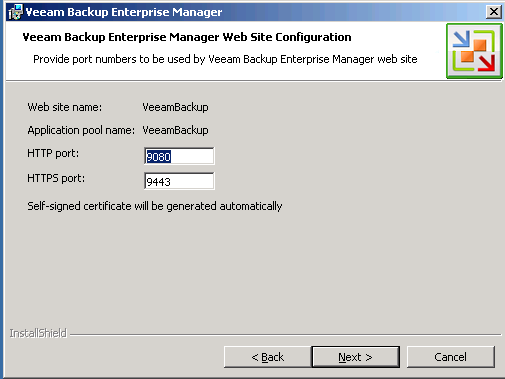 Temporary change the Service account to Domain\Administrator and finish setup. Right after the setup you can change the Service account and assign the right permissions to the account you want to use. 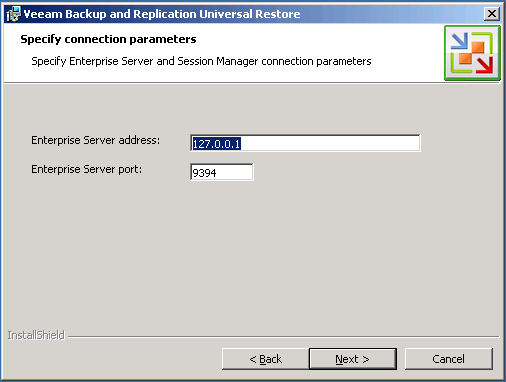 take a note of the http and https ports so you can configure your firewall when needed. 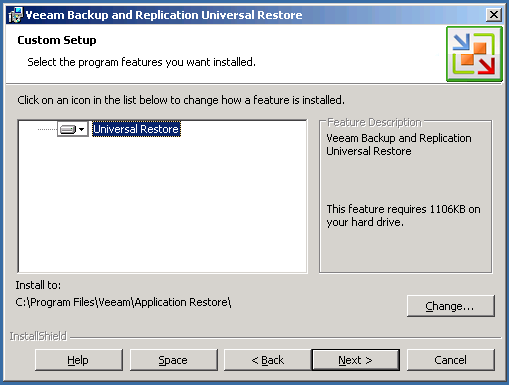 The installation of the Universal Restore plugins is the easiest part of the whole setup. It’s just next.. next.. finish. 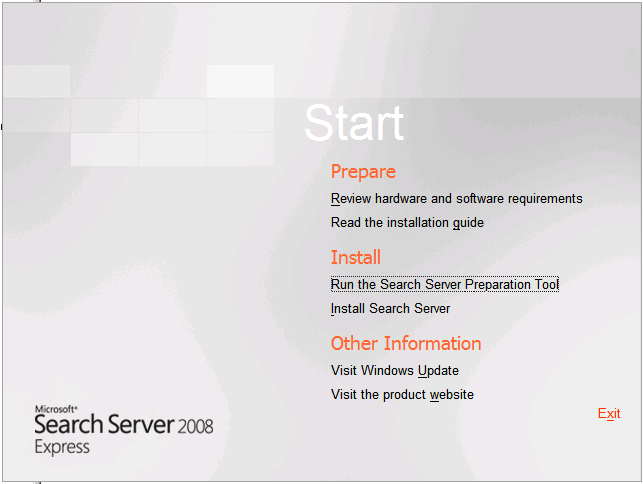 - Microsoft Search Server 2008 (including Express Edition). 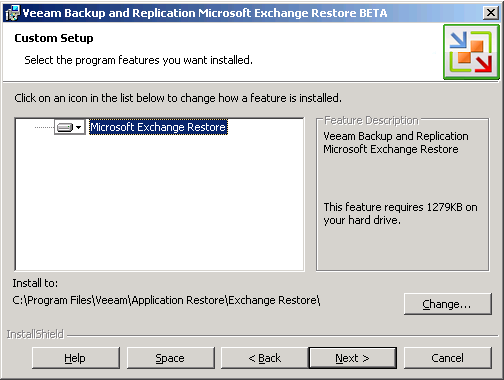 - Microsoft Search Server 2010 (including Express Edition). 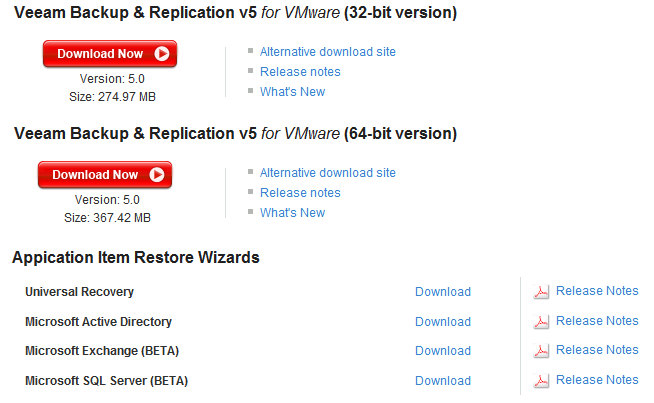 The product Backup Server it’s only restore VMDK pure… can you confirm please? Thanks in advance for your replay!